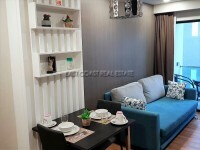 This spacious 1 bedroom unit is situated in a popular building in Jomtien. Conveniently located right on the taxi route this condo is only a few minutes away from the Jomtien Beach and Pattaya City. This unit is fully furnished and comes with European kitchen, built-in cabinets, full A/C and hot water throughout. The complex is well maintained and has 24 hour security and large communal swimming pool. Available for rent on a long term contract basis only.